Thirty-five Korean delegates arrived in Nueva Ecija, a remote region in the Philippines, for the second stage of Global Peace Leadership Exchange (GPLE) Alllights Village Project: this time to brighten not only homes but entire villages. 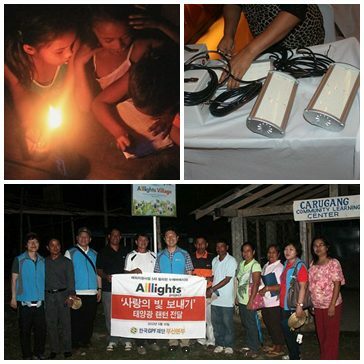 After providing 430 indoor solar lamps to five towns in Nueva Ecija, GPF-Korea distributed 15 solar lamp posts to three villages during the Exchange on May 8-10, 2012. These outdoor solar lamps are currently helping to brighten village streets at night while improving the lives of families in the community. GPF-Korea Seoul City Chapter donated five solar lamp posts to the Alllights Village in Sitio Sinipit, Barangay Santolan, Palayan City; Pusan City Chapter donated five lamp posts to the All Lights Village in Sitio Karugang, Barangay Bugnan, Gabaldon; and other Korean provincial chapters donated five lamp posts to the Alllights Village in Sitio Camias, Barangay San Juan, Laur, Nueva Ecija. “The areas where the lamp posts were placed serve as a gathering venue for the residents at night,” said Federico Baltazar, leader of Sitio Sinipit in Palayan City, Nueva Ecija. “We gather every night to plan for tomorrow’s activities, we gather to celebrate this blessing we received in the community. “We agreed that May 10 should become an annual celebration in the community for the Alllights Project,” he added. Even more enthusiastic are the women in the community. Having a solar lamp at home had helped both their children’s study habits and their family budget. “The money we usually spend for gasoline is now being used to buy other household needs, or we save it for our children’s education,” shared Noemi Santos, a mother of three. “They now enjoy doing their homework,” added Erlinda Baltazar, a resident of Alllights Village in Palayan City, Nueva Ecija and mother of two. 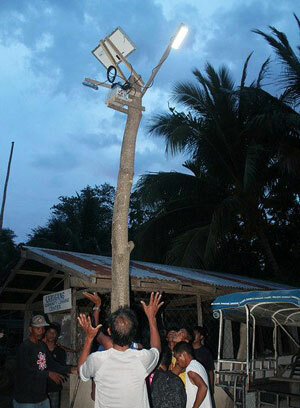 After distributing solar lanterns, Korean delegates and Filipino villagers had a “Dream Tree” planting activity. Children participated by writing their dreams on a piece of cloth which they tied on each tree. As the trees grow, the children will be reminded of achieving those dreams and dreaming big. Mr. Young Kwan Kim, the owner and CEO of the solar lamp manufacturing company in Korea, who participated in the 5th Philippine-Korean Global Peace Leadership Exchange in Nueva Ecija, said he was inspired to see that his solar lamps are giving light, hope and life to the rural Philippine residents. Local leaders have pledged to support the sustainability of the program, and residents have promised to take care of the solar lamps in their communities. From left: Representatives of the Provincial Governor at the opening of the GPLE; children of an Alllights Village; GPF-Korea Vice President Jason So, GPF Philippines Dr. President Michael Zablan and Dr. Ann Montejo-Arevalo interviewed at TV 48 of Nueva Ecija.